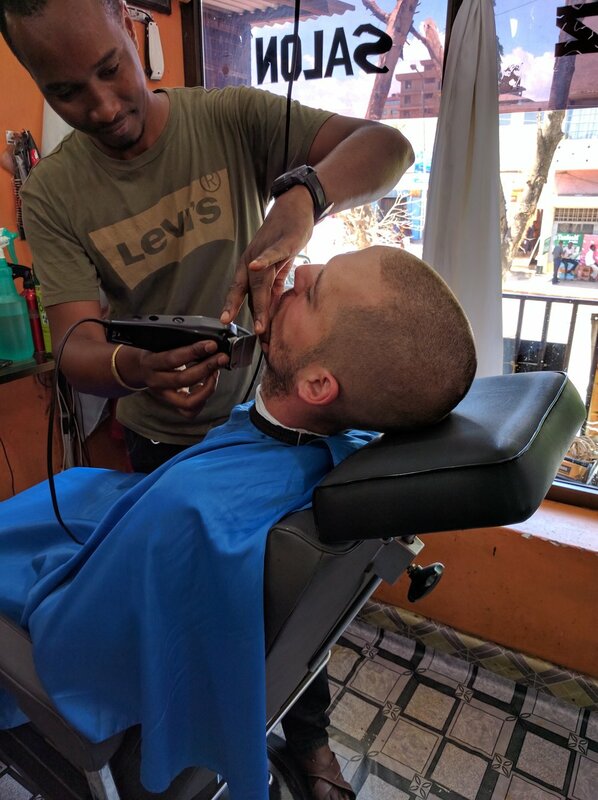 Over the past few months, we have posted about Jeff’s experiences with haircuts. There was the time he got a military ‘high and tight’ in Ireland, the time he was practically razor burned in Africa from such a close cut, and his street style in Vietnam. 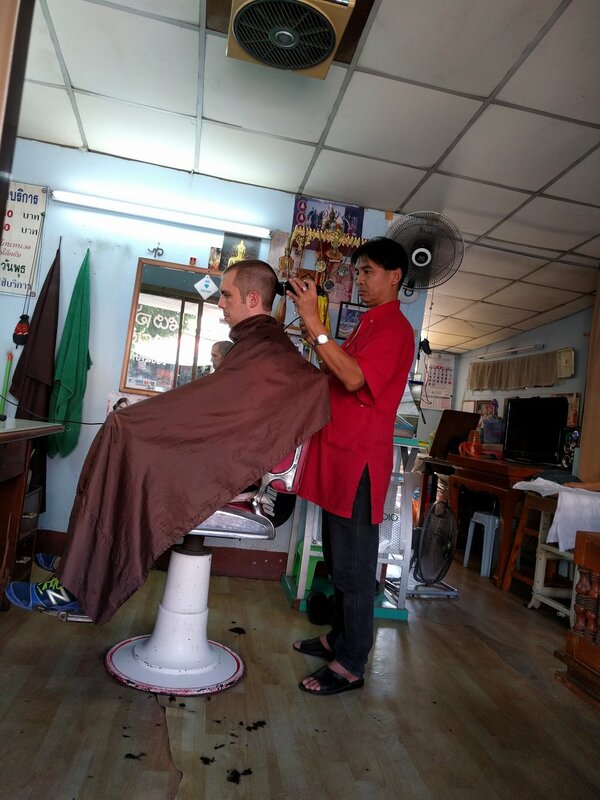 Most recently he walked into a random barber in Chiang Mai, Thailand. We’ve noticed that there is quite a ‘spa culture’ in SE Asia. Just like in Vietnam, there are multiple massage parlors on every block, and hair and nail salons everywhere in Thailand. It’s been 8 months since I had a haircut, so I figured that it was finally my turn to find a salon! I also wanted to go big and get a perm so my hair might actually look good without styling it. Note: I have never treated, colored or permed my hair before. Go big or go home! 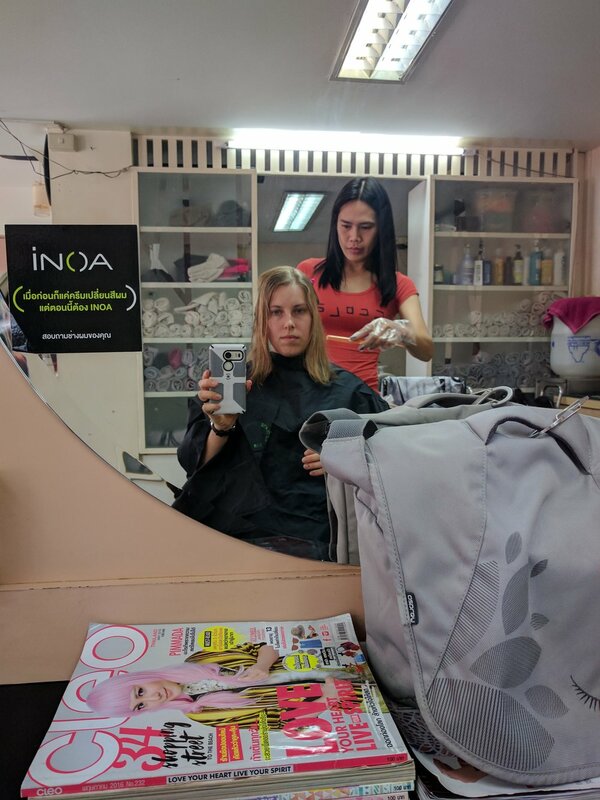 I wandered around Chiang Mai trying to find a salon that looked decent, and that had a reasonable price for a cut and perm. I eventually found one that told me it would be 2,000 Baht (about $66). So, I sat down in the chair and asked the stylist if she had ever permed blonde hair like mine before. She said, ‘No.’ Looking back, I probably should have gotten up and left then, but lately I have been noticing how many strangers we put our trust in daily. The random taxi driver we trust with our lives, staying in other people’s homes, following some guy on a motorbike to a bus station when he never asked to see your ticket….trusting people with my hair is just another adventure on the list! Anyway, I asked what type of perm she was going to do on my hair. Sidenote: I use the term ‘she’ loosely. 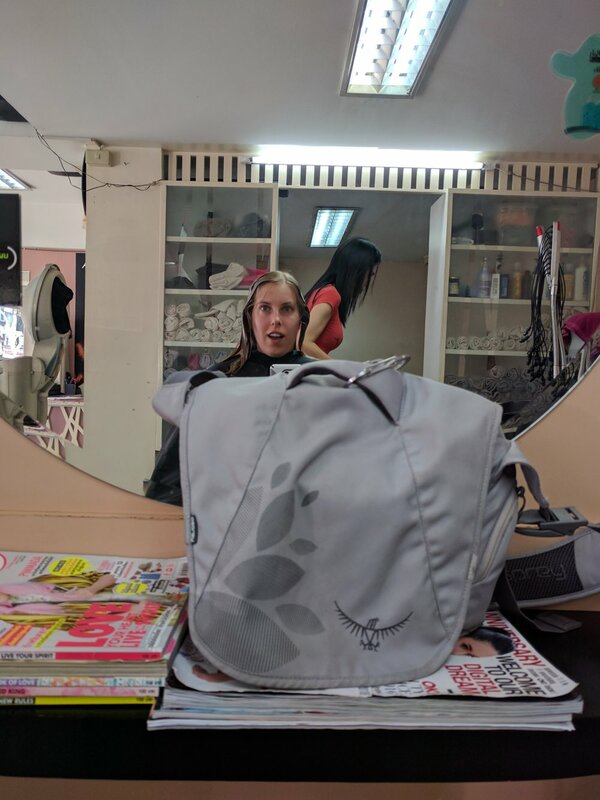 My stylist may have been a man-lady, which are pretty common in Thailand. She had a deep voice, extremely large hands and a potential mustache. None of this matters of course, and I digress… Her response to my perm question was ‘digital perm.’ Momma didn’t raise an idiot, and I had done some research on perms. Digital perm = for Asian hair. My hair is pretty much the exact opposite (blonde and pretty thin). I expressed my concern, but she was adamant that digital perm would work with my hair. So, I let her go with it. Step 1: haircut. She cut my hair while it was pretty much dry, minus my sweat- it’s hot here in Thailand! Step 2: they send you in the back to the shampoo girl. You pretty much lay down on a table and lay your head in the sink. It’s way more comfortable than the awkward chair things we have in the States! Step 3: Blow dry. The stylist and the shampoo girl tag teamed my hair with 2 blow dryers to do the job. Which in my opinion is a bit excessive considering I don’t have that much hair. Step 4: Then came the perm. Those of you who have had a perm before will have to tell me if this is normal, since now I can only tell you how digital perms go…She separated strands and gooped my hair up, then I waited for awhile. Then she put the curlers in, more waiting. 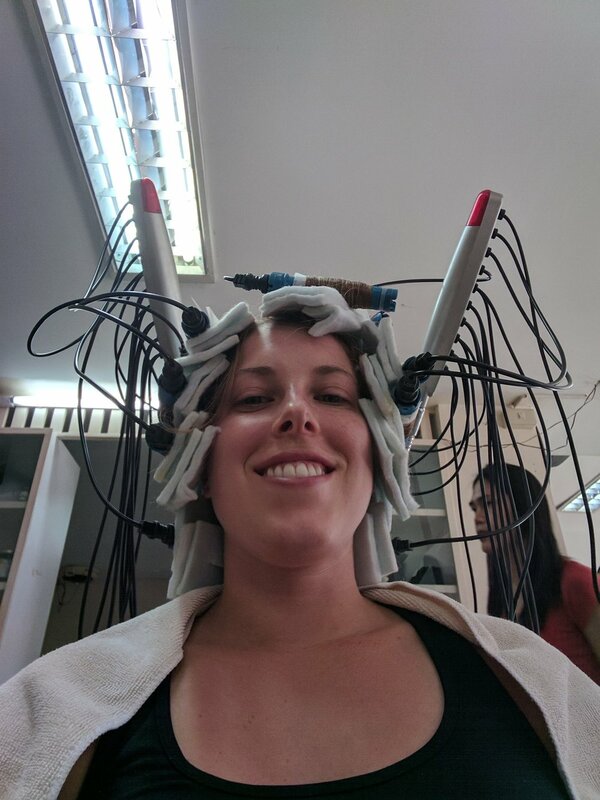 Then she attached them to the heat machine, more waiting, then she poured more chemicals over the curlers after they had cooled, more waiting, then they took the curlers out…….and……. 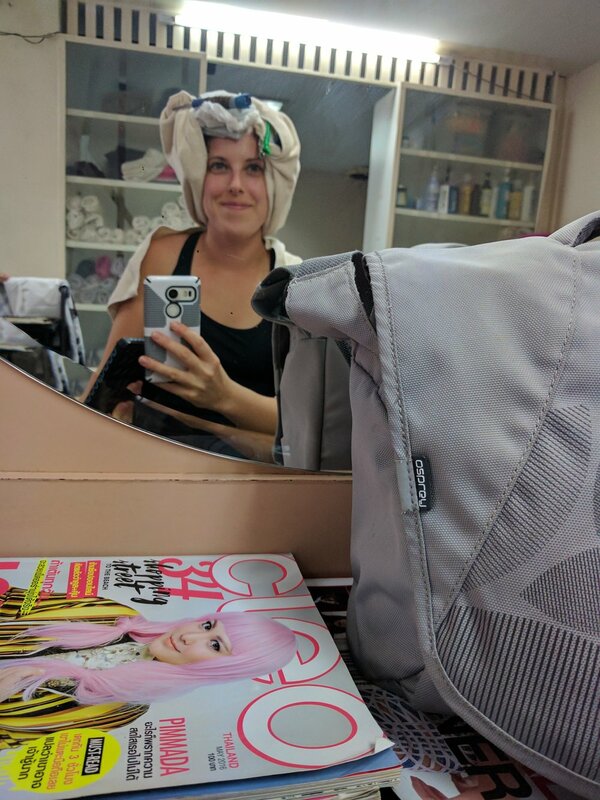 I’ll be honest, I went into the salon with zero expectations. Hair grows back. I wasn’t really that upset that the perm didn’t take. I think I surprised the stylist because I laughed when they found out it didn’t work. My hair is ‘same-same’ as it was before I walked into the salon, except now I just have an Asian hairstyle- a pretty blunt cut (no layers). After she washed out the chemicals (do the chemicals actually ever go away? ), she blew dried and styled my hair nicely. It probably ended up being the nicest my hair has looked in 8 months! At least I had a nice 'do for dinner that night! Hopefully I will still have a full head of hair in all future photos. If I start losing hair, at least now you all know why! My adventure wasn't a complete loss! I found this art fair going on at the Chiang Mai University, and bought myself a cute pair of earrings from the tent on the left!